With just a little over a week before we make the three day trip home, I finished sewing up a couple of take-along bags. 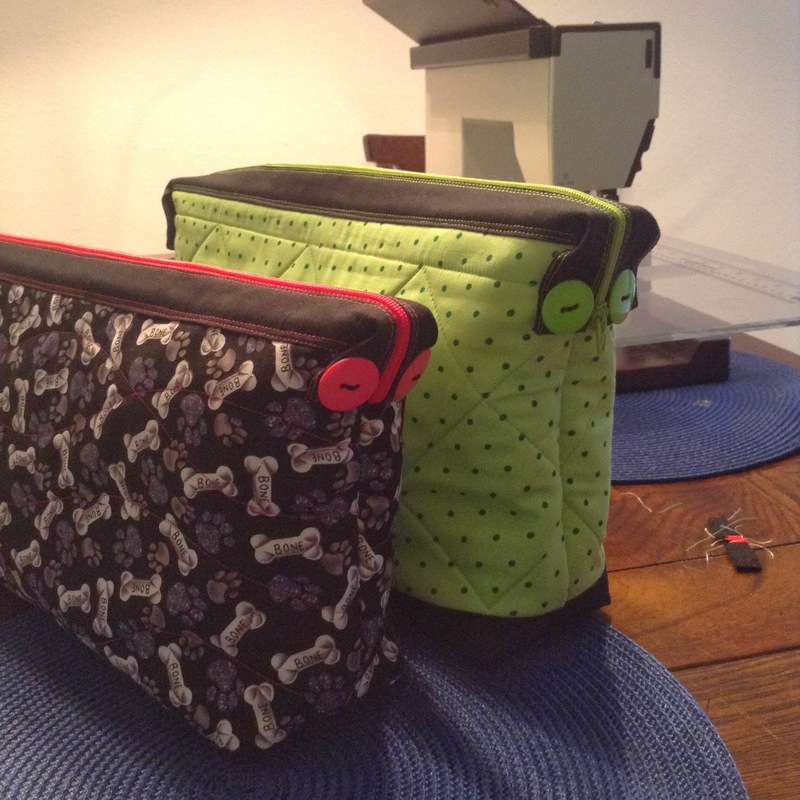 The lime green one is a hostess gift for a friend of mine. We will be staying at her place for a night or two before heading north. And the dog biscuit fabric one is for her puppy. She needs her own bag for when she travels, right??? My old travelling sewing machine is ready to be packed up now along with all the projects. 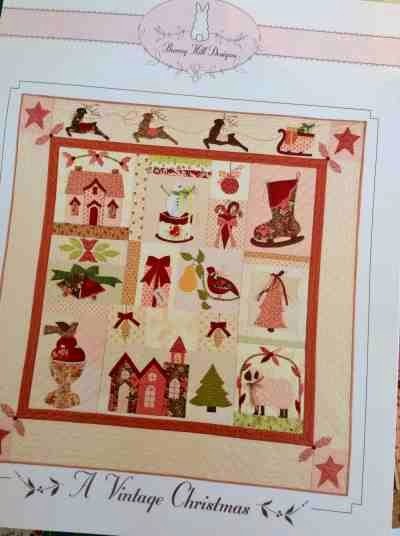 I may pick up my hand stitching project again if I feel the need to stitch. 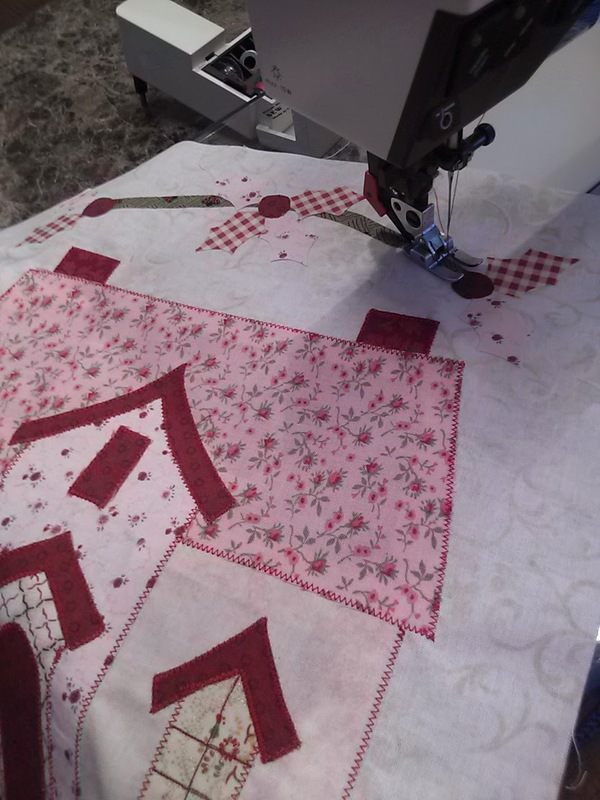 I had seen this fun machine quilting technique a while ago and recently came across a tutorial on Pinterest. I really like the look. I put together some scraps from a recent project to give this spiral technique a try. The hardest part is starting the circle. I started by drawing the center with a frixion pen. The stitching gets easier as you go. The hard part is not to stitch fast. If you do, you will skip stitches. I really love the look. 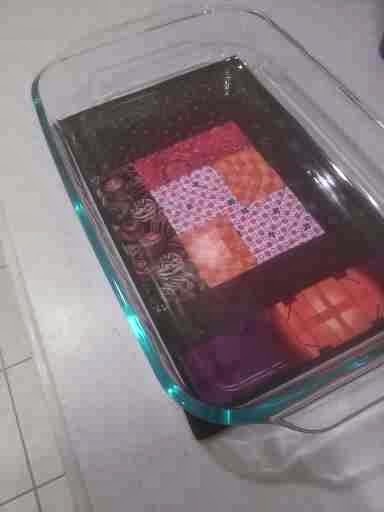 I used two layers of warm and natural batting and now I have a nice scrappy hot pad for my 9 by 13 Pyrex dish. Why not give this technique a try. 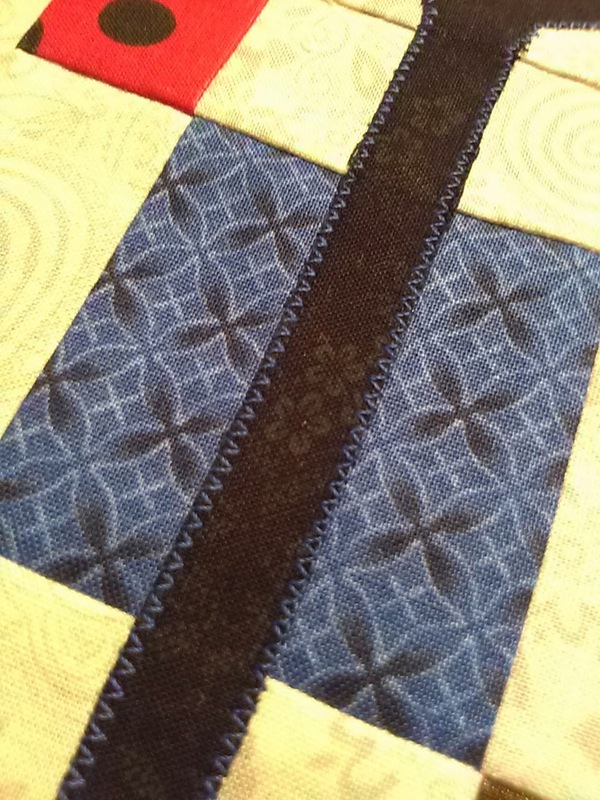 The tutorial can be found here at the Quilting Edge. 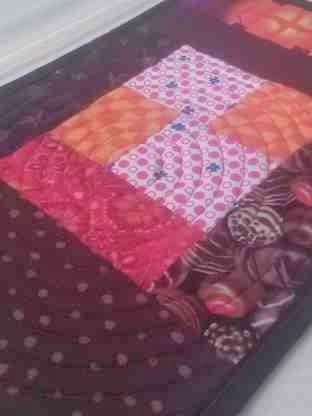 I've packed up my A to Z Block of the month and will do the April block when I get home. But lucky for me, I have another BOM project to start working on. This is an older pattern.. I bought a compete kit for this sweet Christmas project. If I do a block a month I should be able to have this done before Christmas. Here is my first block It's a sweet Victorian house. I'm using a dark cranberry red thread to applique the edges. I like how it defines the outlines. You can see some of the holly above the house is not stitched yet, and is barely visible. But adding the outline applique will make it very easy to see. Is it too early to start working on Christmas projects? 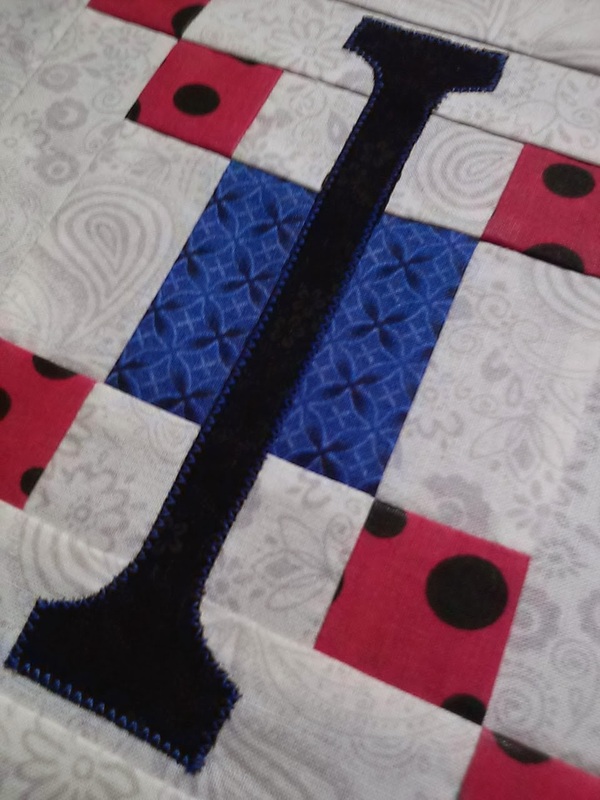 I had been putting it off the applique for my BOM blocks. Fear helped me to procrastinate. Yesterday, I had the black thread out and had decided to use it instead of the colored thread... But since I had the blue thread in the machine, I tried it on the practice piece. You know, I didn't mind the look of the blue applique. The colored applique doesn't show that much. When you look really close, its visible, but when you are looking from a few feet away, it's hardly noticeable and just adds a hint of color. 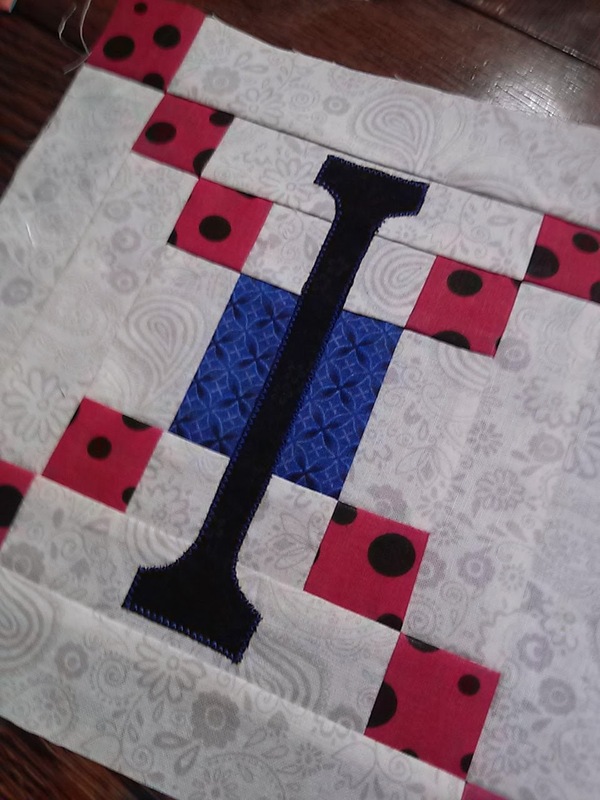 I now have all the January, February and March blocks appliqued in various colors. I'm waiting now for the April blocks. Of course, I'll be home in my own sewing room by the time I'm ready to sew them. 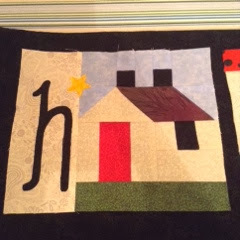 TQS BOM - March H and I blocks done. It was a rainy day. A small drizzle this morning turned into a farmers dream. A steady all day rain. So a great day to make my March blocks. As I mentioned before, I purchased a few colors of thread to do the appliqué. But I'm still working up the nerve to use the coloured thread to applique the letters.. I may do a practice appliqué piece tomorrow. 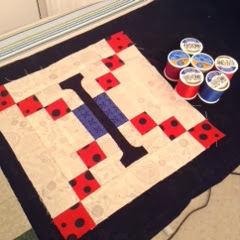 If it looks good, I'll do the "I" block with the blue thread. And then there will be no going back after that.